Here’s a gift everyone could probably use – a $75 gift card to Whole Foods! Go stock up on fancy mushrooms (or whatever you want)… leave a comment below and tell me your favorite way to cook with mushrooms. And if you don’t like mushrooms, well then you’re not eligible (kidding!!). This giveaway is now closed. Congrats to Caroline, the winner. Thanks for all of your comments & wonderful mushroom ideas! In the summer, grilled portobellos all the way — and in the winter, I love a good wild mushroom risotto! I love Portobello burgers as well, but I really love a wild mushroom bruschetta. I love mushrooms raw, cooked, whatever! I’ll eat mushrooms any way, but I love mushroom soup particularly. I love to grill portobellos and make portobello steaks! My favorite way to eat mushrooms is mixed with quinoa and feta for a great side dish! I adore every type of mushroom and prefer them simply in an olive oil, garlic, and salt & pepper saute. I love a creamy mushroom soup! Polenta with sauteed wild mushrooms and cashew cream! I am a fan of chopped up mushrooms cooked into a creamy sauce for pasta! Sauteed with garlic in butter. Simple & delicious! I love putting mushrooms on pizza! So many yummy topping combinations that include different types of mushrooms. I used to hate mushrooms until I tried a mushroom ravioli at a local restaurant and was completely mindblown! It didn’t have the funky texture I’d gotten to know from previous dishes. Love the flavor, learning to like the texture. It’s a process. Put them on/in anything and I’m golden, but I’m a real sucker for spinach and mushroom pizza! There is a mushroom ragout recipe in Plenty that is ridiculous. Especially so because it’s basically just mushrooms and broth poured over garlic croutons and topped with a poached egg. It’s insanely simple and delicious. I love to add them to risotto, although after seeing your polenta recipe yesterday I might have new fave way! Love me some mushroom strudel! Now that winter is here, I can’t wait to make some beef stroganoff with tons of mushrooms. I love a good sauteed mushrooms in a bit of white wine, butter, and fresh herbs. However, my fave way to use them is sauteed in a frittata with kale, onion, and bell peppers! I love making a Russian mushroom “caviar.” So tasty! for quick everyday mushroom usage i like them in an omelette. yummy. for saturday night snack we like them on a thin crust pizza. I actually like them in dumplings! Shiitake-tofu dumplings are amazeballs! Roasted mixed mushrooms on creamy grits with red wine sauce and a poached egg is such a comforting and delicious winter meal! Mushroom veggie burgers or simply grilled with a balsamic glaze. I love mushrooms cooked in red wine sauce! Mushrooms in everything!!! Love them as a little something special in spaghetti and lasagna! Heidi Swanson has a great recipe for Mushroom Soup w/ Wild Rice that’s become a favorite of mine. I really only know one way, saute them in butter for a looooong time. Definitely stuffed and grilled portobello mushroom burgers! Which I would make with this gift card! Hot and sour soup with LOTS of mushrooms! i love mushrooms on a pizza or in an omelet. sauteed with olive oil, garlic, salt pepper and sherry vinegar!!! Sautéed with butter and wine with a little bit of cream thrown in towards the end, then served over a steak, or a chicken breast. Or some pasta. I think I just figured out what to have for dinner tonight! Mushroom risotto is my favorite!! And sauteing them with a little coconut for a meaty lettuce wrap. YUM. My favorite is in risotto – in particular with asparagus! My favorite way to have mushrooms is sautéed in butter with onions and thyme and spread over baguette. But my favorite ‘dietitian’ way to have them (job requirement!) is stir fried with sesame oil and mixed veggies over brown rice. first saute whole garlics until they are soft and browned as if they are roasted, then add a little butter and a splash of sweet vermouth, then add mushrooms. serve alone as a side or with pasta with arugula wilted in! how the heck do you get your mushrooms so clean and speck free? I will eat mushrooms in just about everything, but one of my favorite fall recipes is for mushroom, butternut squash, and sage pasties. Yum. I love marinated wild mushrooms on toasted brioche. Yummy! My husband and I go chanterelle picking every year. We love to put it on homemade pizza in place of meat! M not a fan of mushrooms, but have taken to chopping them up fine to bulk up ground beef in recipes. Very budget friendly and I don’t even know they’re there…it’s the texture that usually gets to me when they’re prepared whole. I love putting fresh mushroom slices on my sandwiches. Oh, and sauteing mushrooms with scrambled eggs. AH! So many mushroom choices, SO LITTLE TIME. Our favorite lately is to braise mushrooms with onions and kale in red wine with a little sea salt and red pepper flakes – it’s delicious! Hi! I just started reading your blog last month and I am loving it (so is my husband! 😉 Last night, we made your mushroom and spinach enchiladas with the amazing cashew poblano crema. So tasty! I’m thankful to have found your blog. Your recipes are approachable, fresh and inspiring! I love making a vegan Bahn Mi with portobellos sauteed in soy sauce. Yum. Mushrooms grace our table weekly. A favorite? A variety of mushrooms sautéed over polenta. stir fried on top of soba! Marinated with garlic. Just sooo good. Mushrooms!! My favorite! I could easily spend that whole gift card on them. And the recipe I love them in the most…Barbara Lynch’s mushroom crepes from her book Stir. Sage butter and piles of mushroom: heavenly! I thought I never liked mushrooms- but then I tried your rosemary mushroom ragout. OH. MY. GOODNESS. You are so brilliant! You’ve turned me into a mushroom-lover and I love it! Now I just need that gift card so I can stock up on mushrooms for life and I’ll be set! Thanks so much for the great giveaway and I LOVE your blog- all the recipes I’ve tried have been delicious! Yum! I love putting different kinds of mushrooms on pizza and playing around with that. I also love slices of portobello on a cheesy grilled sandwich. Portabello, basil and mozzarella sammies with roasted red pepper spread. I could eat them every day! I love mushroom and barley soup with fresh dill in the winter, and spinach and mushroom pastry puffs for party appetizers. They always get rave reviews! Chopped Portobello sauteed with a little olive oil, balamic, and shallots! So tasty. It’s heard to pick a favorite mushroom recipe! This is my favorite decadent one: http://www.101cookbooks.com/archives/fennel-mushrooms-recipe.html. Slice and then sauté onion, garlic and mushrooms until they are cooked. Season with sea salt and pepper. Spoon this mixture over lightly toasted bread. Top it off with grated cheese and broil for a couple of minutes. And voilà, that’s sizzling, mushroom bruschetta! I don’t love mushrooms, but I did put them in a fresh green bean casserole last Thanksgiving and it was delicious! Sauté! Put on toast. Enjoy. Mushrooms are a staple in my fridge, my fav is making a spinach mushroom scramble with eggs. Thanks for the lovely giveaway, I subscribe to your blog and it’s one of my fav reads. I love to marinate portobellos is garlic, onion, balsamic and oil then grill them. Yum! I love mushrooms but unfortunately they don’t love me. I found out I have a sensitivity to them so I haven’t been able to eat them for a while. I used to always get them on pizza, though. Not huge fan of mushrooms but I do love whole foods! I like them best in stir-fry and thai food! I love stuffing big portobellos with loads of veggies. my favorite way to eat mushrooms is in risotto. i make an amazing risotto with spicy italian sausage, mushrooms, shallots, and spinach. it’s insanely delicious. I love the umami deep flavor dried shiitakes put in broth! Oooo! I LOVE mushrooms. My husband makes an amazing polenta with mushrooms and Swiss chard. I have been wanting to try your kale mushroom ricotta calzones! I love using mushrooms in risotto! My boyfriend thinks that heaven begins with porcini mushrooms at your feet. I’d use this for risotto. Thanks for this opp and thanks for your blog. I get excited every time I see a new blog post! A big juicy grilled portobello burger! Grilled portobello burgers – so yummy! The best way to cook mushrooms is in a saute with butter and lots of garlic! Then you put it all on a piece of crispy sourdough toast and eat it with a fork (due to melty butter overload). Thanks for the giveaway opportunity! I love mushrooms, especially in risotto. pretty much any way…but in a lasagna is always good! Love them in my burger and pizza! And can’t forget a big juicy stuffed mushroom. Right now- chanterelles roasted with Brussels sprouts! Heaven! I love stuffed mushrooms with goat cheese and spinach! I love my cremini-morel-shitake mushroom and leek stuffing. Yum! Doesn’t get more mushroomy than that, right? Sautéed in red wine over a grass fed steak. I’ve never been much of a mushroom person, but after recently conquering olives, it’s next on my list. This would be the perfect way to try a wide variety! Not the biggest fan of mushrooms, but I do love them in Hot & Sour soup or on a pizza! Can’t go wrong! Sautéed in butter with garlic and tossed with pasta and a handful of Parmesan. Sautéed with arugula and butter, then topped on grits. Plus the 1st Whole Foods in Mississippi (that I know of) is opening on my street in 2 months! It just so happens that I am sauteeing some mushrooms tonight to put on polenta. Mushroom tacos are probably my favorite though. I’m not a fan of mushrooms, but I love Whole Foods! One of my favorite ways to cook mushrooms is to broil portobellas with crabmeat and garlic herb cheese wedges stuffed inside. I love to saute mushrooms with olive oil, rosemary, and pepper until golden and then sprinkle them with flaky salt. I like to eat those plain or put them on top of white pizza! I love mushrooms in a frittata or in soups! I thought I didn’t like mushroom UNTIL I had stuffed portabellos! Now I’m a fan of all sorts of mushrooms and are trying them in many recipes. I LOVE mushrooms! I could probably use it in almost anything. Lately, I’ve been loving Japanese Enoki mushrooms in a hot pot or even a simple miso soup. In my eggs, in my stir-fry, and in a tomato/avocado/sprout sandwich the other day. Sometimes when there’s pizza with mushrooms, I eat the mushrooms, but not the pizza! Is that crazy? Mushrooms sauteed in butter and wine are the greatest! I love mushrooms any which way though. Love mushrooms in everything, but especially soup! Roasted with gatluc, butter and lemon juice. impossible to choose a favorite way! I love roasted mushrooms over a salad of greens and fresh herbs! Over grilled bread with a poached egg on top. Heaven! Mushrooms on crostini are delicious. Sauteed with garlic and shallots and topped with a bit of shaved parmesan. Or there’s always creamy mushroom soup. Yum! Mushrooms with something creamy—always hits the spot. I also love quickly stir-fried mushrooms. Roasted portabellas with peach salsa in the summer! Divine! I’m so torn between Smitten Kitchen’s mushroom bourguignon and How Sweet It Is’ mushroom melts with mustard aioli. I can’t pick one as a favorite because they’re both soooooooooooooo good! When I go out camping I take a big bag of wild mushrooms, wrap them up in tin foil and let them roast over the fire with onions. Then eat them over toasty bread. Mushrooms are my meat! Every dish I make has mushrooms. They add so much flavor. I think I like them especially in tacos. Yum! Stuffed mushrooms are my favorite…any kind! anyway i can get them! Although I’m not a huge fan of mushrooms, I DO enjoy making portobello fries! I absolutely love sautéing up mushrooms and having a nice bowl of pho with them, or any bright soup, really! But the main way that I eat mushrooms is raw with spinach, scrambled, soft boiled or poached eggs, and fruit in the morning. I love to make grilled portabello mushroom “burgers” with roasted red pepper and balsamic. I also love to use shiitake mushrooms in miso soup. Sautéed with peppers and onions! I love a good miso soup on a cold day, with both enoki and shiitake mushrooms! And, it never hurts throw some spinach, vermicelli noodles, and tofu in there too. Sauteed chantrelles in just about anything! I love pasta with chanterelles in a creamy sauce! Your creamy polenta & mushrooms! It is has been a mushroom explosion ’round here (although I have been leery of wild mushroom since a fateful Thanksgiving weekend when I was about 10). I use them in Tom Yum or otherwise spicy/sour soups. And I love to pick the extra-crispy mushroom schnibbles off a slice of pizza. I love to grill them and dress them with balsalmic and lettuce, useing them in place of a hamburger for a piece of summer during the winter! I love a grilled mushroom cap burger with grilled pineapple! Tomorrow I’m making a new favorite (hopefully!) — roasted acorn squash stuffed with mushrooms sautéed with rice and kale, topped with toasted walnuts and feta cheese! I love roasting mushrooms! Yum!!! Everything. But the liquid that remains from soaking dried porcinis is magic. I’ve got a mushroom stroganoff on the menu for next week. Yum! I love to make portobello mushroom pizza! Using the mushroom as the “dough” base and add pizza ingredients. Mushrooms are a must on our weekly grilled pizzas. Lately I’ve been obsessed with adding chanterelles to everything. But my favorite is probably mushroom bourguignon. I love to make omlettes with spinach and mushrooms and any other veggies I can find around the house! I love grilled mushrooms with any sort of pasta! I love cooking mushrooms with burgers or chicken! i love mushrooms all ways but my recent favorite is in Vegetarian Stuffed Peppers! when you dice them small and sautee with onions, celery, and garlic they get sort of a meaty texture and taste very savory and delicious! For Shitakes, simmer slices with melted butter, a pinch of salt, and a splash of water. Let liquid cook off and stir occasionally until the mushrooms crisp around the edges. Top with pepper and parsley, or not. Tastes better than bacon. love love love mushrooms! I tend to favor an earthy shitake: they can really transform an entire dish. I love mushrooms in a frittata or scramble. Or anything. Yum. I love to make mushroom risotto…or experiment with them! I love to add them to ramen/udon/soba broth. My fave way to cook mushrooms is to sauté them in a little butter, garlic and salt for a simple side dish! All the ways! Particularly, on the grill, on pizza, or Spanish style with lots of garlic and olive oil. I use enoki mushrooms as a noodle substitute in asian broth! Yum. Saute in butter with a little lemon juice, or in Boeuf Bourguignon, or in an omelette, oh yum. Enoki and Oyster mushrooms in some hot ramen with a soft-boiled egg. Chewy and satisfying texture. Warms you up for the winter. When I’m not eating them straight from the package, my baby bellas usually end stem-side up, drizzled with olive oil, on top a roasting pan. Throw on some garlic and maybe some onion so that all of the flavors cook together. A healthy pinch of salt for absorption, a splash of wine for adventure, a good grind of pepper for kick, and 20 minutes under the heat, leaves you with svelte melt-on-your-tongue shrooms, to be eaten on thick toast, eggs, polenta, you name it. Perfection in the button-hole of a vegetable. Sauteed in butter with a bit of salt and pepper on it. My grandpa would bring chanterelles from his hikes and prepare them like that, I’ve never tasted more delicious mushrooms. portobello burgers! however, that creamy polenta recipe might be the new favorite. sauteed.. definitely.. a little butter & garlic. YUM! A recreation of one of my favorite dishes from a local italian restaurant – mushroom ragu tagliolini with truffle oil and pecorino romano. YUM!! Being a Minnesotan, I believe the best way to consume mushrooms is with wild rice, especially in the form of a creamy mushroom wild rice soup. That is a tough question but I have to say – thinly sliced and sautéed with a pat of butter, then eaten straight out of the pan. So good! Portobellos stuffed with butternut squash, couscous, and butterbeans, with some lemon juice on top – SO DELICIOUS! LOVE mushrooms with fettucine Alfredo and in breakfast scrambles. I tried the kale and mushroom grilled cheese and loved it! Yum! New favorite, but I also love mushrooms on pizza and in omelettes. Chanterelle + roasted beet salad! I love mushrooms and am particularly partial to them in soups and on pizzas &/or flat-breads. Delicious! Thanks for the giveaway! I LOVE mushrooms just about any way, but sauteed with lemon and nutritional yeast over pasta is nice. I love mushrooms sauteed with polenta! I’m obsessed with king trumpet mushrooms. I slice them thin with my mandoline and crisp the slices with olive oil. They’re great for garnish, snacking, or as a bacon substitute. Mushrooms are just so delicious! Can’t wait to try some of these recipes! mushrooms roasted in garlic and balsamic vinegar. the. best. Grilled! Or stuffed with just about anything. Stuffed mushrooms are my all time favorite! I don’t eat shellfish or pork, so finding a restaurant that makes ones I can eat is hard. I just make them at home and enjoy them all! I love a good grilled portabella sandwich, but I’m also pretty partial to my homemade cream of mushroom soup. Lately I’ve been using sautéed mushrooms in my soups for a meaty texture. In the spring I crave locally harvested morels, which are excellent any way you cook them. Beef bourguignon…perfect answer for all the cold weather hitting ATX right now! oh wow.. there are too many ways to eat mushrooms – they are definitely one of my favorite foods! I would say one of my favorite ways is on a pizza with parmesan cheese, topped with a fresh arugula salad. I’ve been using dried mushrooms (re-hydrated) as a way to enhance the flavor and umami in vegetarian soups. Yum! I love mushrooms anyway I can get them, but I particularly love Shiitake mushrooms in an Asian stir fry. Yum! I love mushroom duxelles rolled up in puff pastry pinwheels. Yum! I just made a mushroom risotto. Something about the creaminess mixed with the earthiness of the mushrooms makes it a cold weather favorite! sautéed and put in my homemade tomato sauce! I love putting mushrooms in my eggs! Might sound weird, but it makes for a really decadent breakfast! Roasted with garlic, topped with butter sauce, lemon and parsley! I love mushrooms in any form, but my favorite is mushroom gravy! I love this creamy mushroom pasta we make. Oh my goodness, I am so excited about this!!! Holding my breath since I could use this so much! Sauteed and put on a burger. I could eat mushrooms any way possible! I put them on my salads raw everyday for work and then keep it simple when I want to cook them by sautéing with garlic and a splash of balsamic. Holy yum. Mmmm, I love mushrooms in a savory bread pudding (with Gruyere? with Gruyere!). Their unctuous addition make the comforting dish so, so luxurious. I love mushrooms but especially enjoy them roasted. I put mushrooms in everything! Stir fry, curry dishes, pasta, and I love making fajita and cheese “steaks” out of portobella mushrooms! I love the meaty texture mushrooms provide to my vegetarian shepherds pie! As I read this I am eating a mushroom-garlic egg scramble-best breakfast! Stuffed with olive tapenade and Parmesan. I love them tossed into pasta or just slightly warmed up with garlic to top toast. I love a rich mushroom risotto in the winter. I make a wild mushroom pate that is creamy, earthy and wonderful as an appetizer! Will try the potenta as it’s cold and gray here in IN..need a warm-up cozy dinner! I love mushrooms in everything! One of my favorite ways to have them is sauteed and served over creamy polenta. My favorite way to cook with mushrooms would have to be creamy mushroom pasta. Yum! I love adding mushrooms to breakfast scrambles, but my favorite way to eat them is to add them to mac ‘n’ cheese. I love roasting them and putting them over rice with sauteed greens and peanut sauce!! I love to saute button mushrooms with a bit of butter, salt, pepper and fresh herbs. I add the mushrooms to any other main dish as a delicious side full of umami. I love to saute mushrooms and then crack an egg or two over them and bake the whole thing. Easy, delicious, and impressive brunch. 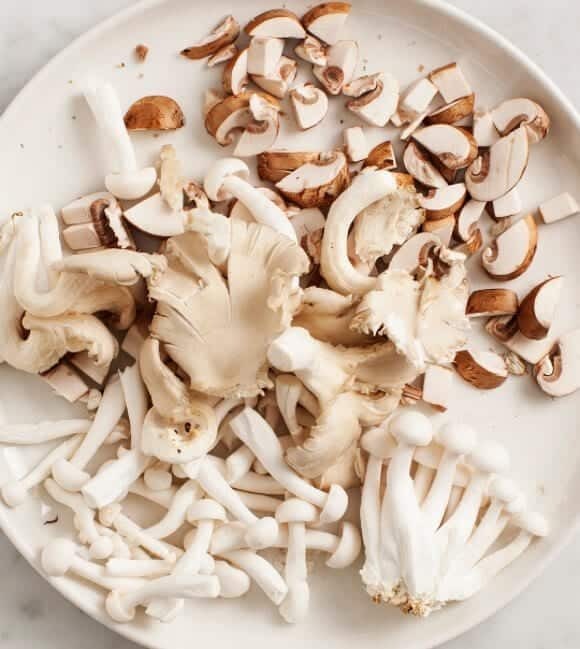 Mushrooms are one of my favorite ingredients, and I believe they are best when prepared simply — Roasted in the oven with extra virgin olive oil, butter, garlic, capers, and fresh herbs. Then eaten right out of the pan with crusty bread. YUM. I love mushrooms pan fried in an omelette. Pork chops smothered in mushrooms and onions. My mom made this all the time growing up, it brings back memories. Simple and sweet: sauteed up in a knob of ghee with some fried sage! Love mushrooms anyway that they are cooked! I love to make puree mushroom soup! sauteed with olive oil, garlic & sea salt! I love broiling portobellos topped with fresh mozzarella, tomato sauce and fresh basil. My son just made a cornbread, sausage and mushroom dressing at Thanksgiving that was so good. any way! I love to make them sauteed with grapeseed oil and red pepper flakes, mixed into quinoa with swiss cheese. Portobellos on the grill with just butter, salt and pepper! I love mushrooms in everything. My favorite lately is roasting them and tossing with pasta and lots of cheese. We like to forage for porcinis and then thinly slice them for pizza. Oh my! Oh my gosh in anything…but lately I’m loving a mixture of wild mushrooms sauteed with butter, white wine, and thyme, spread on slices of baguette for the best crostini ever. I love mushrooms on kale and onion pizza – yum! In my opinion mushrooms practically beg to be combined with creamy, melted cheese. My favorite way to eat them is sautéed with a little onion & a fresh jalapeño pepper. Then layer it all up between tortillas with plenty of cheese. Yum! My grandma makes mushroom soup! Slowly grilled yakitori style with jsut a simple sprinkle of salt! So delicious and flavorful! I love mushrooms and roasted tomatoes on pizza! White whine, fresh thyme, & garlic! Served on top of good toast. I love mushrooms in Spanish omelettes sautéed beforehand in olive oil. Thank you for hosting this giveaway. I love shiitake mushrooms in soup. yum! I love wold mushrooms in a cream sauce over polenta! Just had porcini hot chocolate (http://hungerandthirstforlife.blogspot.com), which was an unexpected delight. Huzzah to the Hunger and Thirst Web site again. I used to despise mushrooms, but since becoming vegetarian I’m coming around! My favorite way to eat mushrooms are in fancy tacos. yum! Mushroom and Cognac Soup is a must in the cold days of late fall/early winter. I love mushrooms sauteed in evoo in pasta! Yum! I love when Chanterelles are in season! I take a handful of these, very coarsely chop them up, saute them in butter with a bit of fresh parsley and a tiny bit of garlic. Then, I simply pour them onto a piece of wonderful rustic bread that has been toasted. Breakfast, lunch, snack, you name it. SO good. Simple and sauteed with butter, garlic and a little white wine. It’s a toss-up between in a cheese-onion-sausage-and mushroom omelette, or simply stuffed with goat cheese. Clearly, cheese is a theme and will be a large part of that WF purchase if (or if I don’t) win. I like to take mushrooms and cook them in a combination of butter and olive oil in a pan, then add some vegetable stock (or chicken stock) and cook some more, then add some cream and then some sherry. I eat this on toast. I learned this in England where even the most unsophisticated people do this routinely. I just made creamy polenta with mushrooms. I love mushrooms and will eat them all sorts of different ways! cooked down w/ balsamic, over polenta! I love adding mushrooms to asian soups. cream of mushroom from scratch with pasta! I love mushrooms in risotto and ramen! So cozy. I love adding different types of mushrooms to stews and soups at the very end (particularly enoki mushrooms). It just jazzes up any soup. Wild mushroom risotto…mushroom slices sauteed in butter and garlic and deglazed with a bit of vermouth is really heavenly! I’m one of those mushroom haters… hope I’m still eligible! I tend to substitute it for other earthy meaty veggies such as eggplant. I was so excited about the fancy mushroom sale at WF over Thanksgiving! I love them many ways, especially roasted and tossed with something savory! I love them sautéed with garlic and onions….and I deglaze the pan with balsamic. Yum! I am not a huge mushroom fan, but at Rioja (Denver) I absolutely loved the mushrooms in my grilled kampachi. The ingredient’s listed on their website: roasted spaghetti squash, red verjus poached quince, matsutake mushrooms, shiitake mirin broth, scallion. Amazing! I love my mushrooms with brussel sprouts and bacon! In this weather… there is definitely a wild mushroom risotto in my future! OMG I love mushrooms in any form. I think my fave way to eat them in mushroom ravioli with brown butter sauce. Makes me want some right now. I love to sautee mushrooms and toss them into peas for a veggie medley. I obsess over roasted mushrooms! Also love them stuffed, pan sautéed. Raw. Really any way they come, I eat’em! Thanks for the opportunity! I LOVE making stuffed mushrooms – usually stuffed with a mixture of bacon, crab meat and cream cheese with a hint of cayenne for some spice! I’d make a dairy free mushroom bisque! roasted mushrooms stuffed with cashew cheese! I like to sautee mushrooms before tossing them in with my egg whites, spinach and feta..ie perfect easy breakfast! I love mushrooms with a great steak! My parents always sauté portabellos with shallots and brandy for our holiday dinner; just the thought gets me humming “Happy Holidays”! I’ve made Aida Mollenkamp’s mushroom bulgogi recipe quite a few times and can’t get enough. Oyster mushroom tempura, and just a simple dish of enoki mushrooms in butter are irresistible to me. I love mushrooms in chestnut apple stuffing, and also baked stuffed mushrooms with bread crumbs, cheese, and herbs. I love mushrooms. I made a mushroom wellington for Thanksgiving. It was divine. My favorite way to cook with mushrooms is to make a creamy mushroom soup!! We sauté them in garlic & oil, and add them lat minute to a creamy potato base. Just last night I made a roasted mushroom and white bean soup w/ sage and thyme. It was delish! Would love to win a WF gift certificate! I love mushrooms on top of homemade pizza! Mushroom soup! I’ve tried to replicate the mushroom soup they make at my local whole foods because it is so delicious! Sauteed with a little butter, some white wine, shallots & garlic, fresh parsley, red pepper flakes and, of course, salt & pepper! Perfect to eat on their own! I love to make mushroom barley soup but that grilled cheese sounds amazing too! I have always loved mushrooms since I was a child. My favorite dish featuring them is something my mother used to make, Russian Pie. It is a from-scratch pie crust made with cream cheese, filled with layers of cabbage, mushrooms, onions, sliced hard-boiled eggs and more cream cheese. I am new to using mushrooms but love how easy they are to cook with. Thank you for the opportunity to win the gift certificate to Whole Foods! On pizza! I don’t cook very much with mushrooms at home, but they are so good on veggie-laden pizzas! I love mushrooms in Whole Food’s mushroom sundried tomato pasta salad!! mushroom lentil soup! or grilled portabellos! Mushrooms are actually my favorite food! I love mushroom pumpkin risotto, portabello mushroom burgers, and creamy polenta with roasted creminis on top! Mushroom soup with homemade mushroom stock and crème fraîche – the best! Vegan mushroom risotto, made with a mixture of fresh + dried mushrooms. Secret ingredient: balsamic vinegar. Yum! Absolutely love mushrooms in all shapes and forms! After reading all the previous comments, I think mushrooms will be on the menu for dinner tonight! I hate mushrooms…but I do love Whole Foods! There is no better mushroom memory for me than walking out my front door in the woods of Indiana and harvesting wild morels. We had a reliable patch in a little gully and it was heaven on earth to harvest those beauties, give them a little swish in water and sauté them in nothing but good Irish butter. Add a glass of champagne and It’s mushroom romance as it should be. Crispy roasted mushrooms are so good all by themselves and fabulous tossed in just about anything from oatmeal to salads to pasta. I love mushrooms!!! My fav mushroom dish to cook is Vegan Mushroom Stroganoff. I make it almost every week it’s that good….and easy. I love them on homemade pizza with my whole wheat dough & tomato sauce, basil, onions, peppers and sun dried tomatoes from my garden..YUM! Sauteed mushrooms with onion and garlic tossed with fresh pasta, goat cheese, and thyme. I love mushrooms!! Raw in salads, and just to munch on with sea salt. For my favorite recipe, I love to make an omelette with buttery sauteed mushrooms and peppers, shitake is a favorite. I love mushrooms anyway I can get them. I love sauteing them with snow peas with a little soy sauce and garlic. So good. traditional stuffed mushrooms are always a crowd pleaser! roast them with onions and toss them in a quinoa salad with parmesan cheese + herbs! I love mushrooms sauteed with spinach and garlic in coconut oil then added to eggs! Cajun seasoning-marinated portobellos, sliced avocado, and quinoa, layered on a seaweed wrap spread with a thai chili paste & garlic aoli (or vegenaise) sauce, sprinkled with scallions…roll and slice! So fantastic you won’t believe you’re not in an insanely expensive fine dining restaurant! Vegan. I LOVE mushrooms and my favorite way to cook them is to simply sautee them with some spinach and serve as a side to salmon or chicken. Mmmmmm. A truly simple preparation of any mushroom is to sear-sautee them in a pan with good olive oil and flaky sea salt. They are perfect served alone or as an accompaniment to almost any meal. I love to roast them! Thought I once made a mushroom tart with stilton and it was amazing. I love mushrooms! Getting ready to make an awesome Frittata with mushroom and spinach. Thanks for the chance to win. I love your blog. I love to stuff mushrooms. My favorite filling involves spinach, artichoke, and lots of cheese. I like to slice and saute mushrooms in butter or ghee until they develop that delicious brown crust on the outside. Just before they’re done, toss in some slivered garlic, a splash of cream and a pinch of sea salt. Turn off the heat and add a few handfuls of fresh baby spinach and toss until wilted. After a long day at work and a sweaty bike ride home, my favorite summer dinner is a perfectly-folded omelet with fresh spinach and farmer’s market mushrooms, topped with homemade salsa fresca. As the days get cooler, I put mushrooms in just about anything! Hot creamy polenta topped with Cambezola cheese and sauteed Chanterelles and fresh thyme. Any kind of mushroom risotto will do it for me too. Whole Foods, augh! I love this giveaway. 🙂 My husband and I love grabbing tons of mushrooms and gently sautéing them with some peanut sauce and noodles. Seriously, we could eat this for the rest of our days and die happy campers. vegan cream of mushroom soup with a drop of black truffle oil on top…yum! I’ve converted more than one meat eater with Portobello Burgers!!! The skeptics finally give in! I love mushrooms any way I can get them, but I usually just sauté them with garlic and parsley and add them to pasta. i love love love slow roasted mushrooms with soy, balsamic, and smoked paprika – spicy veggie mushroom “bacon”! Champignons a la Française….lots of finely chopped garlic and parsley, butter and sautée away! Mmmmm it brings out the nuttiness of the mushrooms, best with wildly foraged mushroons! Truffled mushrooms and scrambled eggs on buttered toast! Eaten with mustard aioli on grilled cheese!!! I have to be honest, I don’t love mushrooms! But I’ll eat them if you mix them in with something else or throw them on a pizza! My favorite way to cook mushrooms would be not at all! We dissected them in high school biology and it makes me looks at them differently. ALTHOUGH Whole Foods catered my wedding, put them in quesadillas and I loved them – didn’t know they were in there until my husband told me! Grilled portobello mushroom burgers, served with roasted red pepper, cabot cheddar cheese and grilled onions….. I really love to add mushrooms to veggie stir fry. I think it’s a great addition! sauteed mushrooms in fresh butter in my mother’s old cast iron frying pan over steak. I love to saute them with olive oil and 365 Meditterean spice. Yum!!! I love a mushroom omelette. Nothing better than eggs, potatos, goat cheese and of course mushrooms. yum! I love mushrooms of all kinds! I saute fresh and toss on pasta, mix with rice, quinoa, millet, amaranth, on pizza’s, in soups, and especially on sourdough with roasted peppers, onions and some daiya cheese as a panini. Caramelized onion and dried porcini mushroom risotto… YUMMY!! In the fall and winter, I love mushroom gravy on everything – biscuits, mashed potatoes, lentil loaf, over rice and veggies. In the spring and summer I love mushrooms raw, or marinated, in salads and in stir-frys or in and on veggie burgers. My favorite are grilled Portobello burgers, marinated in white wine, balsamic vinegar, olive oil, garlic and salt and burger! I’ve gone morel mushroom hunting with my family each spring since childhood. We eat nothing but mushrooms for days and they are delicious. Throughout the rest of the year, I glean what I can from the asian market and buy all sorts of varieties. Right now, I’m into making brothy soups and thick curries with them. mushroom ragout, portobello burgers, and pasta with mushrooms have to be my three favorite ways to eat mushrooms, but I have never met a mushroom I didn’t like. Fresh shitake mushrooms in mitzutaki. I love love love mushrooms. Best way is to just lightly sautee and eat it with anything! I love them sauteed in Marsala wine, butter, and herbs de proveance! Marinated and grilled on the bbq for sure! Smaller ones on skewers or portobellos for veggie burgers! yum! Raw! My three year old daughter LOVES raw mushrooms. I usually saute them in butter to go with chicken but she eats most of them off the cutting board before I can get them in the pan. $75 to Whole Foods would be awesome!!! I love mushrooms sautéed with rosemary and thyme! I absolutely LOVE your mushroom walnut burgers! I have made them several times for dinner parties and people just love them! But I also love chantrelle hunting close to home and simply making them with some chopped garlic and eggs, simple but wonderful. I would love to make the mushroom, millet, and leek frittata! That sounds delicious. I’m not a huge fan of mushrooms, but I’m slowly starting to like them more and more. So far, I really enjoy them on pizza and in pasta sauces! We love mushrooms in our quinoa/brown rice patties – yum! Mmmmmm, sautéed in ANYTHING. So good. mushrooms and pecorino in a quiche, yum!! I’m a mushroom tolerator, a step up from my former mushroom hatred. I do enjoy the earthiness mushrooms lend to any pasta sauce, and they aren’t bad in stir fry either. I love mushrooms in a veggie burger! Mushrooms sauteed in red wine vinegar & garlic. Then let Swiss cheese melt on top of it. It is soooooo good! Love mushrooms mixed with a blend of swiss, cheddar, and brie cheese in homemade ravioli covered with a very light cream sauce. Delicious! My very favorite way to eat chantrelle mushrooms is to sauté them in butter with shallots then deglaze the pan with white white – cook back down and add heavy cream – let it reduce. Pour over a 3 egg omelette – divine! Sauteed wild mushrooms with thyme and cream, served over toast, with a poached egg on top. I could eat this meal every day of my life. I love chanterelle risotto, with shiitakes in miso soup a close second. Sauteed in butter, onions & garlic, combined with fake sausage and mozzarella on top of a pasta drizzled with truffle oil & parmesan cheese! My fav is making foil packets of sliced mushrooms, olive oil, smoked sea salt and balsamic vinegar on the grill. As an avid (and trained) wild mushroom forager, my favorite way to eat mushrooms is to find some wild ones (my favorites are hedgehogs, porcini, and black trumpets) and just saute them in a little bit of oil with garlic, salt, and pepper. For good quality mushrooms, that’s all they need! Then I’ll serve over pasta or with some veggies. I am generally not one to throw handfuls of mushrooms into most things, but I really love truffle oil. My favorite mac and cheese has a bit of truffle oil in it, and it really puts it over the top. sauteed with a little butter and red wine until the liquid has evaporated, then tucked into a leek or spinach quiche or egg scramble, a la Julia Child! a tie between mushrooms and almonds in a balsamic sauce and a wild rice and lentil salad with mushrooms! Whenever mushrooms are on sale I swiftly grab them! One of my favorite delicacies! Absolute favorite way to enjoy these beauties must be as mushroom bacon on salads with avo and other goodies or in risotto! Swoon! Thank you for the opportunity! Mushroom lettuce wraps are my fave, but I can’t wait to try some of the recipes on your list! My family and I like to sautee mushrooms them eat them on spaghetti with butternut squash sauce (sooo good!). I love using them in lettuce wraps. I love mushrooms! This time of year, I love adding them to soup for flavor. I love mushrooms in soups and stews. They’re so delightful when they soak up the yummy broth flavors, especially ones with a coconut base! Mushroom bourguinone! I found this adaptation on another blog and have since fallen in love. Rich, earthy, hearty and so perfect when you want the real thing without the time or meat. That’s my favorite mushroom use and it calls for lots of them! Hot and Sour Mushroom soup! I love a raw dish of marinated mushrooms in braggs. I also like Portobello sandwich with olive oil, garlic and thyme with sliced avocado and vegan garlic mayo aoli. I like shiitakes marinaded in sake and dashi then roasted with pine needles. I need to learn more about mushrooms, and how to cook them. This $75 will help me buy a variety of them and try different things. Roasted mushrooms are delicious! I use them to top pizza, in paninis, pasta…you name it! I LOVE mushrooms, but my husband hates them. I usually saute them in a bit of butter and olive oil and then add them separately to the meal. MUSHROOMS, onions, kasha, bow tie pasta! Yum! Mushroom risotto for the win! OR, sauteed wild truffles – delicious. Base of sliced shitakes sautéed in butter until crispy on both sides, then mixed with carmelized onions. Sprinkled with a little sea salt. Top a pizza crust with garlic olive oil and mushrooms, over creamy grits/polenta or in a frittata with some Parmesan. Or with some cream and Parmesan for a mushroom Alfredo over quinoa pasta. Yum! So delicious! Hope their are mushrooms at the farmers’ market tomorrow. I love using mushrooms in risotto topped with a fried egg. I make a great wild mushroom ragout! So delicious. So many great options…My favorite option to cook is mushrooms in a marsala thyme sauce over polenta. Or I love deep fried portobellos. Barley risotto with mushrooms 🙂 mushrooms are my fiance’s faaaaavorite food! I put mushrooms in just about anythng I can! I like them in Beef Stroganoff, Spinach Salad, Chicken Marsala — you name it! Mushrooms are my favorite food group! Lately I’ve loved sautéing some baby bellas into my teriyaki tofu scramble. I love mushrooms on homemade pizza, especially with pesto and spinach! Mmmm! Any way. But just sautéed in butter might be my favorite. I love mushrooms any way! Grilled portabello burgers are probably my favorite, but I do love a good old homemade pizza with mushrooms and roasted red peppers! i’ve found king trumpets work best . sliced thin and roasted low and slow with olive oil until deep golden and crispy.. great addition to many different dishes! Chopped up in scrambled eggs, or adding dried mushrooms to soups! Portobello mushroom caps on top of a ridiculously juicy, rare burger. I love Joy the Baker’s vegan mushroom soup with cashew cream. Grilled Portobello Pizzas! Scoop out the stem and membrane, quickly grill each side, then fill with tomato sauce and pesto, and top with pepperoni, onion, and mozzarella! Leave on grill until cheese is gooey! Creamy mushroom soup, I love. I love them prepared simply, all the time! Sauteed in a little salted butter or olive oil, with eggs, stir fries and soups. Also, my friend gave me a recipe for a prepared from scratch “fancy” green bean casserole that we now serve everything thanksgiving! I love then cooked in a little bacon grease… fantastic flavor! Raw mushrooms, thinly sliced, tossed with fresh lemon juice, olive oil, salt, pepper and fresh oregano. Serve with fresh ciabatta to soak up the juices. I love just a good sauteed mushroom by itself just to taste the flavor but I also love them on a good homemade pizza. I love to saute them in butter with thyme and then braise with a little red wine. Serve on top of lightly toasted bread with shaved gruyere cheese and fresh chopped parsley. Delicious! Wow—I would skip and hop in joy if I win this! I love sautéing mushrooms with some grapeseed oil, thyme, and basil then sprinkling some pink Himalayan salt and fresh ground black pepper on them! I love sauteed mushrooms with thyme over goat cheese with crostini. It makes a great appetizer (or dinner if you can’t control yourself like me)! On a sandwich with fresh mozzarella and a fried egg, after being sauteed with butter, onions, garlic, and thyme! Portobello mushroom burger! It suits whatever flavor I’m in the mood for, and I haven’t missed a beef burger since. Yum! The hubbie and I love crimini mushrooms! We’ll take em anyway we can! In risotto – use the stems for the stock! One of my favorite winter meals is a savory sausage with a HUGE side of mushrooms sauteed in wine. I enjoy Portobellos stuffed with cheese, bread crumbs, parsley, & a little garlic, baked in the oven and then served with a marinara. I love slightly roasted mushrooms. I toss a mixed variety w/olive oil, herbs de provence, sea salt and roast on high heat till done. so delicious! I love mushrooms cooked with red wine, garlic and butter served alongside of a pork tenderloin and delicious veggies! Mushroom, Kale, and Wheatberry soup-so yummy! My favorite flatbread is topped with sauteed Cremini mushrooms, caramelized onions, rosemary & Fontina cheese. Sauteed with a little butter and red wine! Simple and delicious. I grow donko shitakes on logs in our backyard, super easy to cultivate which makes them my favorite mushroom! Love them sauteed and served with goat cheese as crostini or in soups, the umami really brings out the flavors! I make a 3 mushroom stacked crepe cake that is so good and rich. Shiitake, crimini and portobellos sauteed with onion and provolone and parmesan and then layered with savory crepes. I absolutely LOVE mushroom tacos! There’s a group that makes vegetarian tacos at farmers’ markets and food festivals around where I live and their mushroom tacos with red sauce and cotija are to die for. I started making them at home and they’re really easy to make and SO good! Sauteed in butter with a splash of worcestire sauce. Ymmm. I love a nice portabello burger with a spicy horseradish mayo! Yum! Sauteed simply with a fried egg or mushroom-chickpea patties. I don’t have many great recipes for mushrooms but your cheesy brussels sprouts (& mushroom) lasagna sounds amazing!! I’d love to try that. Mustardy Chicken Stew with Brown Rice and Braised Mushrooms. It has all of the warm and fuzzy feelings of comfort food, but is healthy too. I made the Smitten Kitchen’s mushroom bourguignon the other day and it was awesome! I pretty much love mushrooms in anything, but my favorite way would probably be grilled mushrooms tossed with carmelized onions and butternut squash! Mmm! I love mushrooms roasted, they get so nice and brown. I love making chanterelle tacos! Right now I’m loving polenta topped with mushrooms in a quick red wine reduction. Yum! I marinate portabella mushrooms with balsalmic, garlic, olive oil and salt for two days. Cutting stems off. Use the left over marinade and make a gravy/sauce out of it. Make califlower mash. Add a little white miso, garlic and butter/vegan butter. Now you have the most delicous vegan Steak and Potatoes!!!!!! My favorite are oyster mushrooms and I like to use them in a “stir fry soup”. Stir fry the mushrooms with scallions, napa cabbage, chili garlic sauce, tamari and a little bit of maple syrup. Then add water and miso paste. Simmer for a few minutes until the miso paste turns into broth, then pour the soup over cooked udon or soba noodles. Finish it with a little chopped cilantro, bean sprouts and toasted sesame oil. So good and super fast! I’m obsessed with this rich slow-braised beef, bacon, and mushroom stew courtesy of Sunset magazine. My favorite go-to dinner is sautéed mushrooms in butter tossed with rice noodles and melted mushroom pate from Pate Moi, sold at the Borough Market in London: so delicious and so easy! As a vegetarian dating carnivores, I love throwing a large Portabello on the grill with some sourdough bread! My 9 YO son LOVES raw mushrooms… yet hates them cooked. One thing we can all agree on is cream of mushroom soup. I think I’ll try some cashew cream next time for the “cream” too! i like them in almost everything! i like to marinate some portobello mushrooms with balsamic and rosemary, followed by either grilling or sauteing them. I’m a sucker for roasted maitake mushrooms. YUM. I usually buy big bags of mixed dehydrated mushrooms from Fungus Among Us and then rehydrate them with boiling water. Make sure to save the boiling water, it’s delicious for added umami flavor in any dish! I love mushrooms in a wild rice pilaf – in particular chanterelles with wild rice mix, thyme and chopped pecans. We made it for Thanksgiving – delicious! Mushroom risotto or a white pizza with mushrooms and rosemary. Mushroom pizza! So good. Or in a stir fry. I love making mushroom tacos. I made mushroom stroganoff with portabello mushrooms. Delicious! i definitely love using mushrooms in risotto! so good. My favorite way to prepare mushrooms is to stuff them. Sweet Italian sausage, spinach, sun dried tomato or red onin, cream cheese, bread crumbs, more fresh herbs and topped with parmeggiano reggiano. Yum! Love to grill portobellos…. soooo delish! I never cook with mushrooms because my partner doesn’t like them, but a friend made chanterelle soup and it was amazing! I think if I got a gift card to whole foods I would spend it on cosmetics or some new kitchen tools, something fun that I wouldn’t normally buy. I love enokitake in hot pot. Shitake, ginger, miso, and garlic soup when I am sick. sauteed with garlic and olive oil! I just love them super well stir fried, so they’re all the way cooked and a little brown. Yay mushrooms! In soup! Shiitake mushroom in a vegetable miso soup. I made it tonight! I like portobello mushrooms, slathered with pesto, dusted with Parmesan cheese, and grilled under the broiler. Yum! I cannot get enough of Heidi Swanson’s ‘Fennel and Mushroom’ recipe. The herbs and creme fresche enhances the mushroom flavor and the fennel is an excellent pairing, as well as a textural pleasure. mushroom stroganoff is my favorite way to eat them! I love to use dried mushrooms in soups. I reconstitute the mushrooms in hot water, strain them, and use the remaining “mushroom broth” as the soup base. Then I add the reconstituted mushrooms back into the soup! I like to make a big nutty, mushroom-y bowl of quinoa for dinner sometimes. Sadly, not a fungi lover. Great taste. Questionable texture. Can always do ’em in Shepherds Pie though as a gravy. Most definitely a marinated and grilled portobello mushrooms, on salad or in a burger! Definitely stuffed – italian style! Grandma’s recipe all the way. I like to make my host-mom’s Nikujaga (japanese ‘meat & potatoes’)- a hot-pot type of stew with meat, potatoes, onions, carrots, and shiitake! I loove mushrooms with omelets! Sign me up,please! I eat mushrooms often with some fried rice and pork chops. Stuffed mushroom with bread crumbs and manchego cheese! I love mushrooms any way, but my favorite is a simple sautee with garlic and butter. Roasting wild mushrooms that are lightly tossed in olive oil and adding to anything- topping a salad, mixing into risotto- you can’t go wrong! I love putting chopped mushrooms into a side dish of Farro with yams/acorn squash with some peppers and onion. I like mushrooms, but tend to have to disguise their texture sometimes! I also like putting them into omelettes for a hearty breakfast! I love stuffed mushrooms with cheeses and sausage. yum Also, a mushroom risotto is always wonderful and comforting in the winter. i love mushrooms in soup, on a delicious thin crust pizza, or on a burger 🙂 mmmmmm! now i’m hungry haha! I love to fry them up in olive oil and eat them crispy by themselves. I love fresh shitake sautéed in a little oil, roasted winter squash tossed with fresh arugula. Then I take crumbled tofu with a little ume vinegar and sprinkle it over top! DELICIOUS!!!! I love grilled royal trumpets with just olive oil and salt–perfection! 1. Simply roasted with olive oil, garlic, thyme, and rosemary. Then sprinkled with a little Malden smoked salt and fresh cracked pepper. 2. In Hungarian paprikash, with mushrooms instead of chicken. When I decided I wanted to become a vegetarian when I was a teenager, my dad worked tirelessly to adapt all of my favorite recipes (his "famous" recipes, which all contained meat!) into vegetarian versions. For the paprikashroom (as we now call it) he uses a variety of mushroom types, and cooks them with butter, onions, red peppers, pimentos, and bay, adding lots of paprika and sour cream and a good hoppy beer along the way. We serve it with homemade drop kluski noodles. It's my favorite comfort food in the world, full of family history and love, that has now become a holiday tradition when we're all back together and in the kitchen again 🙂 Just writing this.. I can't wait! I love to make mushroom meat-balls, using a variety of wild and dried. The secret to getting a meaty flavor is utilizing umami-rich dried shitakes, which I grind into a powder and add along with tomato paste, a splash of coconut aminos, and ground toasted walnuts. I’ll interchange the complimenting ingredient as well, such as eggplant or lentils! It is hard to pick just one! Current favorites include in a pasta sauce, frittata, or on pizza. we have a delicious recipe using mushrooms and onions sautéed in a wine sauce and baked in a bread bowl over chicken!! my four year old loves mushrooms raw though! Right now I’m loving sautéed mushrooms and kale! So delicious and takes no time to make! Risotto! Or filled portobello’s in the oven. Or sautéed with a steak. Yumm….. I think a better question would be what don’t I cook mushrooms with? The combination of mushrooms and spinach seem to show up in my meals on a daily basis. A breakfast scramble. A pasta addition. Or just with some sliced potatoes and rosemary. A Whole Food gift cards would be the perfect way to offset my holiday shopping… and get more mushrooms in my kitchen! I love to use mushrooms for my Gruyere and mushroom tarts! Saute a bunch of shitakes oysters etc with olive oil garlic and a splash of lemon juice!!!!!!! I love mushrooms lots of different ways. They are great with stir fried for example. I love them in a sauce over chicken too. I love simple white button mushrooms, sliced and sautéed with diced onions, tomatoes and tomatillo salsa. Delicious!!!! Sweet, my kind of giveaway! My favorite way to cook mushrooms; saute with red wine like for bourguignon. My favorite mushroom dish is a mushroom toastie with smoked Gouda and a citrus arugula pesto, yum!! Wild mushroom risotto! We use the Jamie Oliver recipe, and it’s so delicious. I love them in chicken marsala with lots of sauce & mushrooms. just sauteed, with butter and thyme! I love mushrooms, especially in a delicious creamy marsala sauce! I love sauteeing them in a little olive oil then adding fresh herbs!!! I am constantly using dried mushrooms that I brought back from Poland where my family lives. They make a wonderful mushroom stock! I don’t know if I can pick just one way, but I love lentil mushroom burgers, and lemon and thyme roasted mushrooms. They’re a staple in our house! A cup of Jo featured the best veggie burgers which included a recipe for a veggie burger made from mushrooms. Delic! love veggie burgers made with mushrooms & love portebello mushrooms as a meat substitute on burgers. mainly i like to sautee them with a little bit of butter and chopped garlic as a side or a snack. it’s so savory. I love to make Portobella burgers!!! They taste so good…you don’t even need meat on that burger! Mushrooms with other fresh veggies dipped in a curry hummus! lately, my absolute favorite dish is a mushroom “bourguignon.” since I’ve been eating much less meat this year, it seemed like the perfect fall-winter dish — and while it took me a couple of tries, I’ve finally gotten the hang of browning mushrooms versus steaming them! I’ve been experimenting with different mushrooms just to see how it changes the texture and flavor of the dish, also adding a bit of fish sauce for some umami 🙂 Honestly, buying new & exciting mushrooms is kind of a pricey endeavor, so I would LOVE, love, LOVE this gift card! I love mushroom red wine sauce on wide egg noodle pasta. I love to make mushroom fajitas with onions, peppers and black beans. Sauté them all with some homemade sofrito and top with salsa. I love any mushroom recipe and these comments are making my mouth water. I want to try them all!!! Thank you! I make a pan roasted chicken sausage and mushroom dish with a ton of balsamic. Delicious! Invented while boyfriend and I were staring at a pile of ingredients with no ideas in mind. Stroganoff or a mushroom-tomato soup! Delicious! I love them in a meat-free stroganoff. I really like making mushroom risotto! Definitely roasted mushrooms with fresh herbs, served with goat cheese sprinkled on top! Mushroom risotto is my favorite! Mushroom risotto with goat cheese!!! My favorite recipe for mushrooms is a mushroom galette that I made the first time we invited my in-laws over for dinner. I was so nervous, as my father in law was particular about his food. He loved the galette and always asked me to make it for future holidays. He passed 8 years ago — but very fall and holiday — I make this recipe to remember him. Mushroom omelets are the best!! My absolute favorite way to eat mushrooms is sautéed with steamed kale! Yum! My children’s favorite way is on pizza we make or with pasta! I don’t use mushrooms enough! But when I do have them, I love them mixed with other roasted veggies and added to salad. I love roasting them and then adding it to risotto! Do I have to pick just one? I love mushrooms in all shapes and sizes and preparations…one favorite is pasta with a morel cream sauce. Stuffed mushrooms! Perfect mini bowls of goodness. Marinated in sherry and added to quinoa with parsley, rosemary, and any other fresh herbs you have to hand with a squeeze of lemon! marinated in sherry for a few days, then cooked in quinoa or barley with parsley, garlic, rosemary, or any other fresh herbs to hand with a squeeze of lemon! I’m in love with mushrooms!!! I love gently sautéing them with cumin, coriander and chili powder for a savory taco filling; sautéing with eggplant seasoned with oregano, cumin and turmeric; or simmering in coconut milk and spiced broth for Thai soup. Love them!! mushroom toast. it makes for a simple (and tasty!) meal or snack. I am not a big mushroom fan, but I do enjoy slow cooker chicken in a cream of mushroom soup. Over rice, it’s pretty delicious. I love to saute mushrooms on the stove top – love when they are caramelized and flavorful! They go great with goat cheese. Delish! The key to a good mushroom recipe, for me, is LOTS of onions. I am still, after 34 years since I first made it, in love with the Mushroom Barley Soup from Molly Katzen’s original Mossewood Cookbook. I don’t always put the barley in it. And following that inspiration to my Southern Girl roots, I started making my chicken livers in bacon fat (I know, I know) with a ton of mushrooms and onions and some soy sauce. I only make that once a year now – for New Years – and I put a generous amount of blackeyed peas in it. I love mushrooms, especially chanterelle. I simply sautéed them with some butter and olive oil. Yum yum! Roasted portobellos with creamy millet from the Sprouted Kitchen cookbook! Melt the butter in a large pot over medium heat. Sauté the onions in the butter/EVOO for 5 minutes. Add the mushrooms and sauté for 5 more minutes. Stir in the dill, paprika, soy sauce and broth. Reduce heat to low, cover, and simmer for 15 minutes. CAUTION: BE VERY CAREFUL when adding the sour cream so it doesn’t curdle. I usually will take the soup off the heat and let it chill out for about 5 minutes while taking small spoonfuls of the warm soup into the sour cream to help it warm up. COLD SOUR CREAM WILL CURDLE if just tossed into the soup. So baby steps in warming the sour cream before adding it in. Mix together and allow to heat through over low heat, about 3 to 5 minutes. Do not let this boil – trust me! I absolutely love anything mushrooms. I recently discovered oyster mushrooms this past summer and what a wonderful discovery!!! I sautee them with tons and tons of garlic and add a bit of vegetable broth and top with lots of dills and served over home fries. Let me tell you it was so delicious i have been dreaming oyster mushrooms ever since but it seems they are a rare birds at most super market. I love to saute shitake mushrooms in olive oil for awhile until they get nice & browned. Then, I usually mix them into a pesto pasta with tomatos, spinach, and some parmesan cheese. They really bulk up the pasta! Mushrooms are probably my favorite food, on pizza, in risotto, you name it and I love them. Love them sauteed in butter and sprinkled with parmesan and fresh herbs! Sauteed with balsamic and fresh herbs, layered on a pizza with goat cheese and fresh arugula. Yum! I make a mushroom gravy and then add in some leafy greens and pour that over millet or quinoa. So good and a great winter meal! cooked down with dry white wine, leeks and garlic served on toasted french bread. yum i’m hungry. Roasted! Cup of Jo recently featured a roasted mushroom recipe and I have made it weekly since then! love spinach, goat cheese and mushroom pizza!!! Mushrooms in omelettes or as part of a big rice/kale/kimchi/seaweed bowl! I love them with pancetta, peas, parmesan and buccatini! mushrooms sauteed in butter atop a burger all the way! Mushroom and tortellini soup is my favorite mushroom recipe. Soo yummy! It’s a close one between soups and quesadillas! Love the “meaty” quality it brings to something like quesadillas and I just love getting a bite of mushroom in soup. My favorite way to cook mushrooms is to saute them down and splash them with some balsamic vinegar. yummy!!! I love to saute mushrooms in oil with fresh herbs and garlic. When they get caramelized, they are the perfect addition to pasta sauces, soups and fritattas but they are also great on their own as a delicious side. sautéed in garlic oil with fresh herbs and lemon – love how they caramelize and the flavor and texture take on something so different from their natural raw state. I also love raw mushrooms dipped in hummus or a creamy dip!!! I love to saute mushrooms with other veggies and then add the mix to any grain. Simple yet so delicious! Mushroom risotto with white wine and parmesan. So delicious! I love my uncle’s stuffed mushrooms but really mushrooms could be in anything and I’m happy! Sauteed with lots of veggies! Sauteed over a juicy steak!!! Straw mushrooms in Thai coconut soup! Sautéed mushrooms on rye bread with a poached egg is a revelation!